Season the chicken cubes with salt and white pepper for ½ hour. Heat up the wok with the vegetable oil for deep frying under medium heat. Add in 1 heaped tablespoon of corn flour on the seasoned chicken cubes. 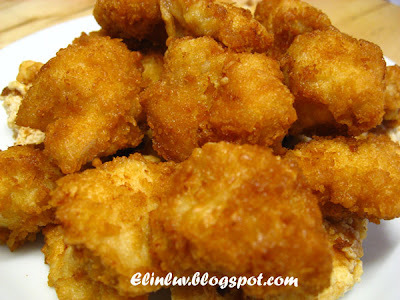 When the oil is hot, dip the chicken cubes in the egg white and coat with the panko crumbs/cornflour. 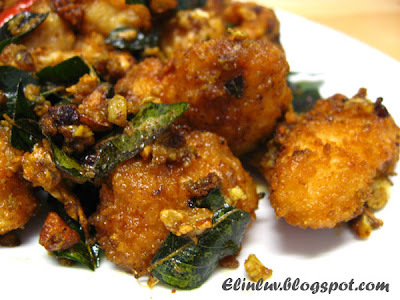 Put the coated chicken cubes into the hot oil and deep fry them till crispy brown and cooked. Dish them up and drain off the extrta oil on kitchen paper towels. Pour the used oil into a mug. Wash the wok clean and reheat the wok under medium heat. Add in the olive oil and butter into the wok. 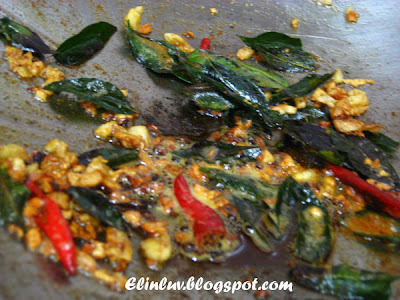 Add in the garlic, curry leaves, chillies, curry powder and sauté till aromatic. Push aside the sautéed ingredients . Slowly add in the beaten egg yolk mixture and keep stirring it into shreds as it is cooking in the wok. When the eggs are in fine shreds , add in the cooked crispy chicken cubes and coat evenly with the sautéed aromatic ingredients. Dish up and serve hot with rice. pls take me, elin! i wanna be your piggy! wow!! I can smell it from my laptop screen. It looks very delicious! It can be yummy high calories snack, crunchy and delicious! This is mouthwatering. Your lil piggies are very lucky! I've just taken my dinner, but right now I'm drooling over your pics. Can even smell it ....esp. the curry leaves. 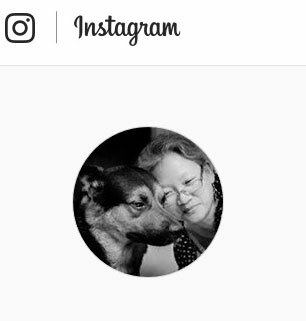 Great momsie! Great Switch up! I can't wait to make this for my family! I'm literally drooling at the sight of this... looks delicious! I can imagine the taste and smell of this dish all the way here in US :) I love cooking this dish but I didn't add any curry powder to it. I am going to try this out soon as it look great. 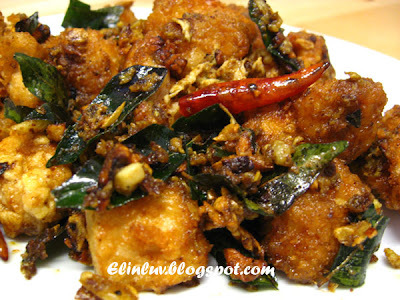 sounds/ looks yummy ^ _ ^ wonder what curry leaves taste like... just like curry power? thank you for the recipe. 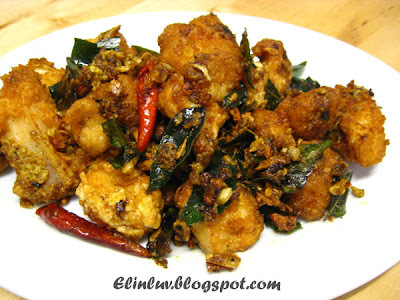 @ ICook4Fun : Gert, you should try a tablespoon of curry powder ...they are great for this dish! @ Short & Bald : Hi S&B, thye sound and taste yummy as the pic depicts. The curry leave has a strong aroma. 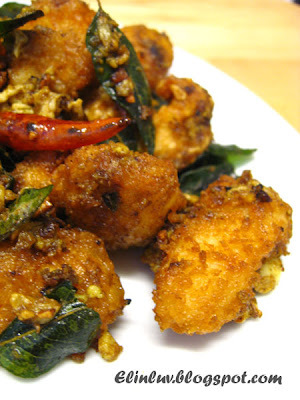 We can't eat them but use them in curries for its strong spicy flavor. As a Malaysian, this is the kind of food we're always looking for! Can't wait to make these. Ah, I heart this! This is reminiscent of butter prawn. I love the aromatic-scent lend by currey leaves! i have been working with u for century and i didnt know u are such a good cook! !...and u still have a body of 25 years old with those food...!!! I am not a good cook, so, have some doubts to clarify. Pls pardon me if you find my questions *tupid, k? What is 1 heaped tablespoon of corn flour? As in 1 tablespoon flat or with a little peak? What is panko brad crumbs/ cornflour? As in combination of 50% bread crumbs and 50% cornflour?